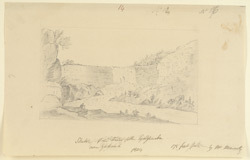 Pencil drawing of the Gokak Falls in Karnataka, by Colin MacKenzie (1754-1821) dated 1804. Inscribed on the front in ink is: 'Sketch of the Falls of the Gatpurba near Gokauk. 1804. 175 feet fall. by Mr Manesty.' From 1792 to 1799 MacKenzie was engaged in a survey of the Deccan. Although there were many interruptions, he theoretically remained Surveyor of the Deccan until 1805. The majority of the drawings in this portfolio were made during 1797 when MacKenzie was surveying between Hyderabad and Gulbarga, the ancient capital of the Deccan. The Gokak Falls, near Belgaum, are formed by the Ghataprabha River as it cascades down a 170 foot high sandstone cliff in the horse-shoe shaped Gokak valley. On the sides of the river are several temples dating from the period of the later Chalukyas of Kalyana who ruled portions of the Deccan from the 10th to the 12th centuries. The Tateshwara temple on the south side of the Falls is dedicated to Shiva. It faces north, an unusual orientation for Shaivite temples. It has a sanctuary with an attached 'mandapa' or hall. The outside walls of the closed hall are from recent times.